Today In this post I will be talking about one of the best & the legendary producer-director, Nasir Hussain who has given Indian audiences hit after hit. He was also known as a major trendsetter in the history of Bollywood. The man known to be the founder of the Indian masala film did not just set a trend but paved a path for commercial Indian cinema as it stands today. With movies like Yaadon Ki Baaraat, Teesri Manzil, Hum Kisise Kum Nahin or even his magnum opus Qayamat Se Qayamat Tak, this visionary producer-director used the formula of great music + high impact drama + star power to catapult his movies to become major box-office successes and winning him the title of ‘Musical Entertainer’. Born on 16th November 1926, Nasir Hussain’s has had a career that spans over five decades in which he has brought entertaining, dramatic and path-breaking movies to the silver screen. 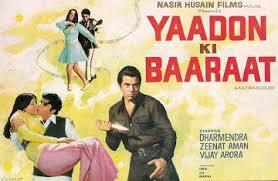 With several superhit films to his credit, Nasir Hussain had seldom created a movie that has failed to impress. Celebrating his journey in the industry, Zee Classic, with its proposition Woh Zamana Kare Deewana, has curated over a month-long series of Nasir Hussain’s greatest hits under the banner 'Nasir Hussain Film Festival'.This series that airs every Sunday at 12 noon, starting 7th January; will take viewers on a journey highlighting his long and illustrious career. 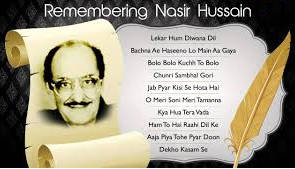 Nasir Hussain was the father of Mansoor Khan, uncle of Aamir Khan and grand-father of Imran Khan. Although the ‘Musical Entertainer’ is no longer with us, his movies still live on. The ‘Nasir Hussain Film Festival’ will kick off with his debut formula film ‘Yaadon Ki Baaraat’ starring Dharmendra and Zeenat Aman as the main leads. Combining elements of action, drama, romance, musical, crime and thriller, this iconic movie became the first of what we now consider truly Bollywood-esque movies. This movie was also the start to an extremely profitable relationship between Nasir Hussain and R.D Burman and features classic melodies like Chura Liya Hai Tum Ne Jo DIl Ko, Lekar Hum Deewana Dil and of course the title track Yaadon Ki Baarat. Yaadon Ki Baarat was not just Nasir Hussain’s debut film, it was also the debut film for Aamir Khan who has risen to be one of the biggest actor-producers of the country. Next in line is the 1977 Super-hit Hum Kisise Kum Nahin starring Rishi Kapoor, Kaajal Kiran, Tariq Khan, Amjad Khan, Zeenat Aman, Om Shivpuri, Jalal Agha and Tom Alter. This movie features songs by veteran singers Mohammad Rafi, Kishore Kumar and Asha Bhonsle including Bachna Ae Haseeno, Yeh Ladka Hai Allah Kaisa Hai, Hai Agar Dushman (Hum Kisi Se Kum Nahi) and Mil Gaya Hum Ko Saathi to name a few. While the music of Mamamia was used as the inspiration for Mil Gaya Hum Ko Saathi, ABBA’s Honey Honey also features in the movie and can be seen playing in the background just before the song ‘Kya Hua Tera Waada’ begins. Teesri Manzil, another box office success and features prominently amongst the Top 25 Must See Bollywood Films by Indiatimes Movies. The movie starring Shammi Kapoor, Asha Parekh, along with Premnath, Prem Chopra and Helen. 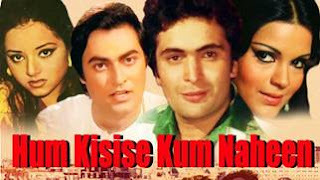 The movie once again underscores Nasir Hussain’s title as the musical entertainer with 70’s pop classics like Oh Mere Sona Re Sona Re and O Haseena Zulfonwali Jaane Jahan. Salim Khan prolific screen writer and Salman Khan’s father, plays a cameo role as Shammi Kapoor's musician friend who pretends to be Rocky in the musical number ‘Oh Haseena zulfon waali’. 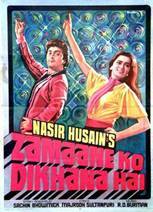 Zamaane Ko Dikhana Hai was Padmini Kolhapure’s debut movie and featured Rishi Kapoor as the main lead. The music of the movie, composed by Rahul Dev (R.D.) Burman features evergreen hits like Dil Lena Khel Hai Dildar Ka, Hoga Tumse Pyaara Kaun and Poocho Na Yaar Kya Hua amongst others. While Dil Lena Khel Hai Dildar Ka was one of the lesser known hits from the movie, it became a rage in the late 80’s and 90’s as a very futuristic electro / techno hit. 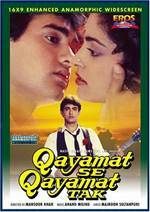 No tribute to Nasir Hussain would be complete without featuring his magnum opus - the 1988 release Qayamat Se Qayamat Tak. This cult classic propelled the lead pair Aamir Khan and Juhi Chawla to superstars overnight. Each song from the movie be it Papa Kehte Hai, Ae Mere Humsafar, Akele Hai to Kya Ghum Hai or Gazab Ka Hai Din resonate deeply and became 80’s iconic hits that have been references in movies even today. The iconic Papa Kehte Hai has featured in more than three movies besides the original including Hum Saath Saath Hai, Andaz Apna Apna and Student of the Year. Actor Dalip Tahil, “I am very fortunate to have worked with Nasir Hussain at the beginning of my Bollywood journey which was a good break for me and transformed my career completely. Nasir Hussain had written the story of Qayamat Se Qayamat Tak himself and he was confident that it will impress the audience. It is because of the content that the movie performed exceptionally well and is now termed as a classic. He considered every nitty-gritty of the movie like the romance and dialogue delivery and blended it so beautifully, the movie seemed picture perfect,” shared his thoughts.